When planning my Friendsgiving menu, something amazing happened. It was one of those moments where you are thinking about one thing you like, then the thought of something you love pops into your head, then you realize YOU COULD TOTALLY COMBINE THOSE TWO THINGS to make this one totally amazing mega-thing. 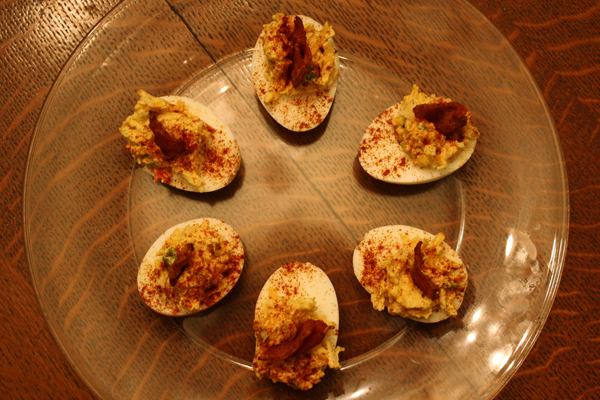 That’s how these smoked pimento cheese deviled eggs came to be. I was thinking about deviled eggs, then I was thinking about pimento cheese, then I realized those two things would probably be excellent combined. Not to sound cocky, but turns out I was right. They were EGGcelent, if you will. So I thought I’d share the recipe with you. Disclaimer: If you think you hate pimento cheese, don’t stop reading now! I was like you! 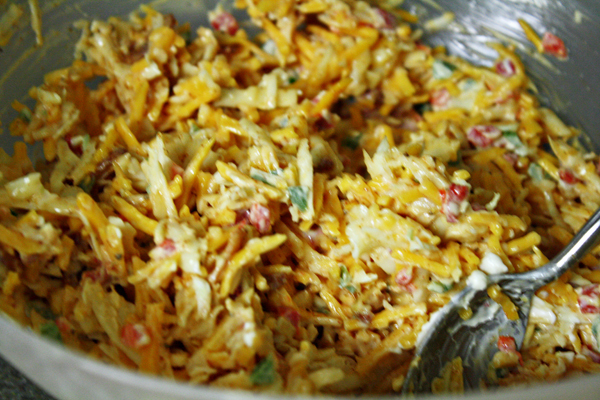 I hated pimento cheese, until I tried the recipe of my former boss, Michele. My pimento cheese is adapted from hers, but not quite the same. Also, this recipes makes extra pimento cheese – so you can eat it by itself too. Yum! 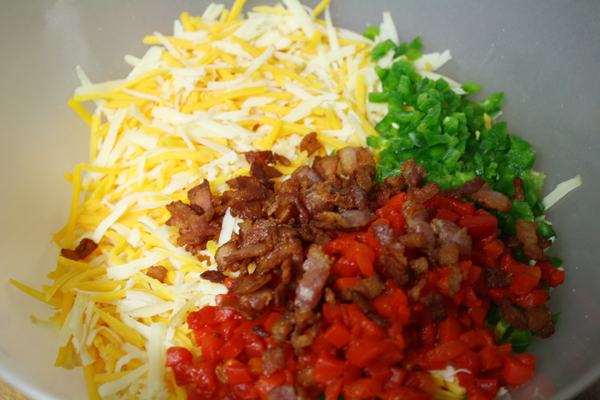 While your eggs are boiling, chop 4 bacon slices into bits and cook over medium-high heat. Move to a plate and drain on a paper towel. Chop the other 4 slices into 1-inch pieces, cook over medium-high heat and move to drain on a separate plate. Next, add the 1/2 cup mayonnaise and stir it all together. This is where you get to go nuts. 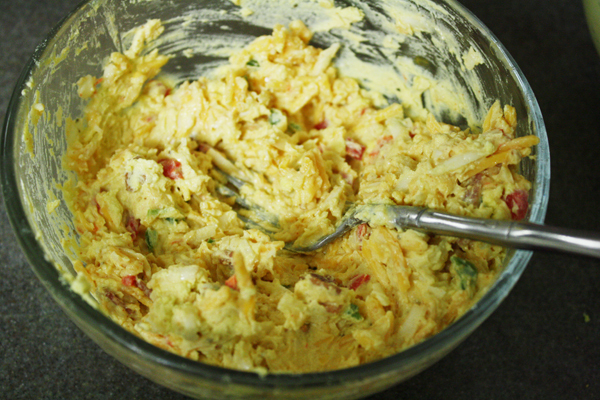 If you like your pimento cheese extra creamy, add more mayo. I usually add a tablespoon at a time until I’m happy with the result. Meanwhile, slice the hardboiled eggs in half, remove the yolks to a small bowl and mash them up. 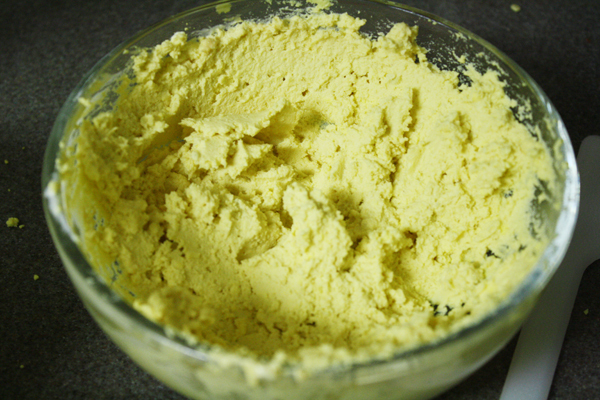 Add 2 Tbsps dijon mustard and 2 Tbsps mayo and mix to form a paste. Once again, add more or less mustard and mayo until it tastes the way you want it to. I like a mustard-y deviled egg, myself. Now that you have pimento cheese in one bowl and egg mixture in another, get out a third bowl and add a bit of both pimento cheese and egg, then mix them together. Keep adding egg and cheese until you find the balance you like. Fill your eggs, top with a 1-inch piece of bacon and sprinkle with paprika. Enjoy! I loved the smoky flavor so much, I’m considering using a smoked cheddar/smoked gruyere combo next time I make them. The sharpness of the cheddar (even though it was mild cheddar) cut the smokiness a little bit, so next time I want to go FULL SMOKE, Y’ALL. 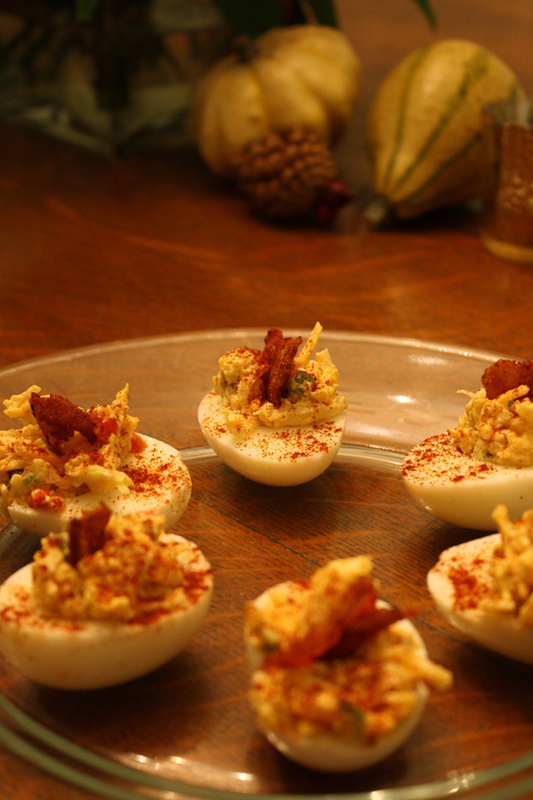 Pimento cheese, deviled eggs and bacon are literally my top three favorite foods. Pinning!